American Girl Things Came in the Mail Today! 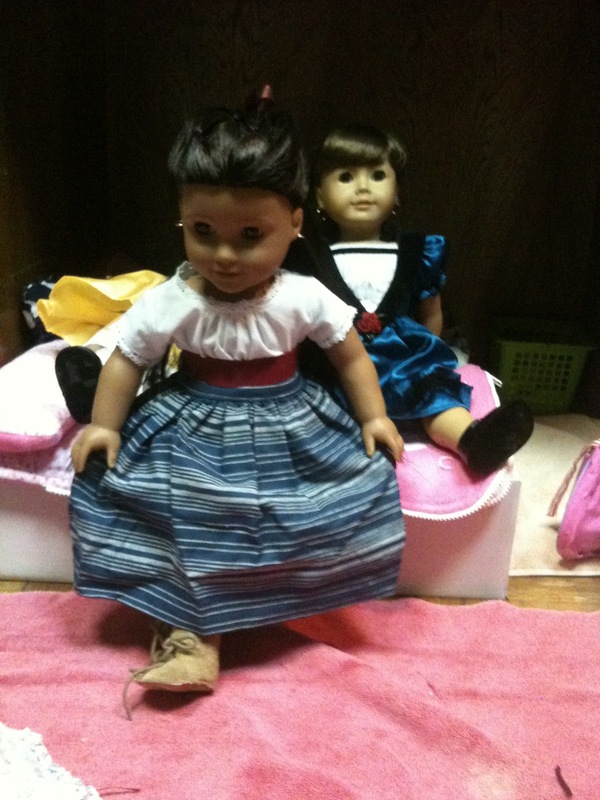 Hello dollies and their mommies! Sorry, my mom had to take a break from all ‘screens’ for a week so I couldn’t post. Anyway, my mom ordered some American Girl things with her Christmas money! We were gonna upload a video here to show you of mom opening her AG stuff that came in the mail. But it wouldn’t upload! We even searched for it in iMovie to try and uplaod to YouTube, but it wasn’t there. 🙁 Grr. 😉 But hey, what’s better than videos? PICTURES! We didn’t think about taking pictures of her opening her AG stuff, by Cece and Josie just HAD to model! Cecile: Hello Miss person staring at the screen. I am curtseying which is the polite thing to do when you meet someone. 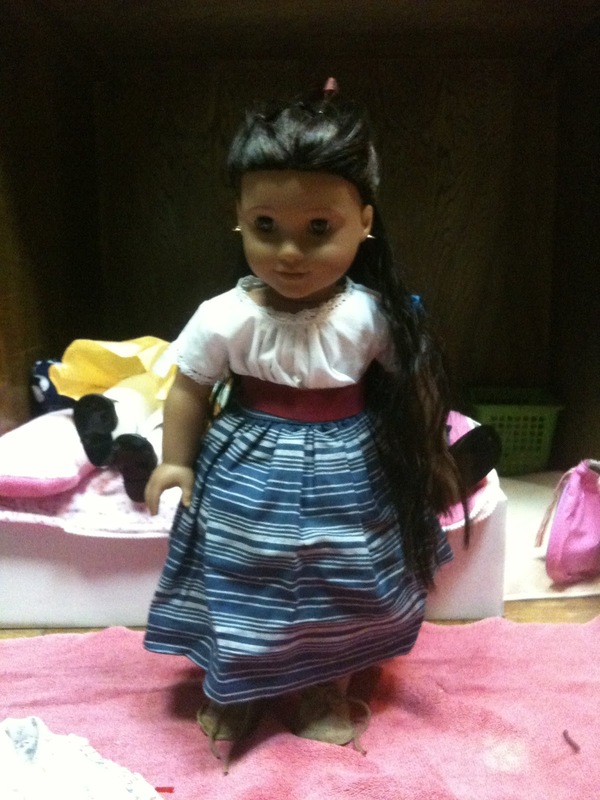 Josefina: Hola, me amiga, Hello my friend. My School Outfit contains three pieces: A white, traditional blouse, or camisa, and long, blue-and-white striped skirt, and a red sash. No under-garments, they come as part of the Josefina doll and book. Well, that’s it, girls! I’ll be posting more this week! Oh I would love to see how all your girls get along! I hope to be posting photo-stories this week! 😀 I will be sure to consider that idea! Yes welcome back!!! Madison when you get on the AGFMB go to this thread or just click the link!! Madison: I will be sure to check that out! And thanks, I am glad to be back! Happy New Year!! I hope you had a great one! I also hope, Madison, that you’re having fun with your new dolls and clothes and toys! I had SO much fun the other day! I played Salon with my dolls and did a whole bunch of new hairstyles on them! It was so fun and they all look SO cute! What do you think of Saige (GOTY)? Isn’t she SO cute!! I know! LOL! That balloon is HUGE!! I did NOT expect it to be that big! She was calling to me SO much! LOLOL! I was considering getting her on my bday in February but decided not to get a doll that day since Caroline is still so new. I don’t know if I should get her though! UGH!! LOL! Oh so cute! Can you do a review on Cece’s outfit? I give the outfit a 100 A+! I have no complaints about this outfit. Gorgeous and easy to put on. 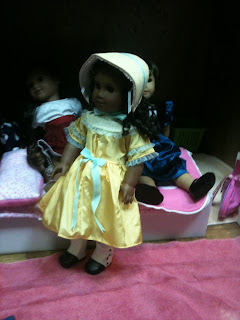 Comes with little boots, the gorgeous yellow with blue ribbon Summer dress, and (a big surprise!) 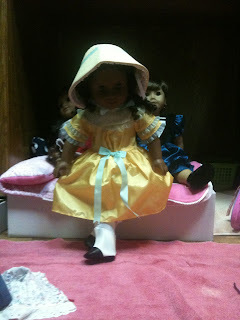 A sun bonnet!! So adorable. The shoes and dress close and open in the back with Velcro. The sun bonnet has laces that you tie under the doll’s chin to put on. Very adorable, easy to put on, and will provide many years of fun play time.